I’ve quite enjoyed this week’s Back To School Blog Challenge. It’s been fun sauntering through the old memory banks and writing about my past. Today, however, I want to wrap up the challenge with a post about the present. 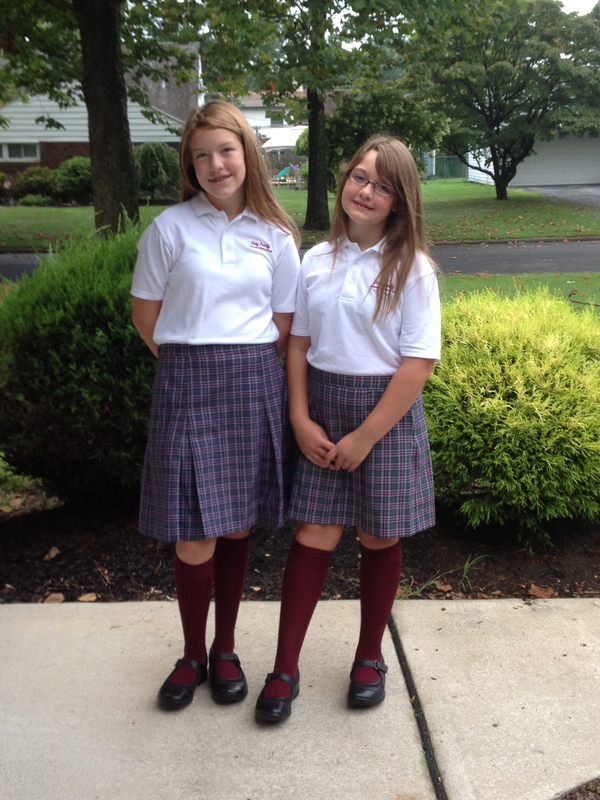 My two oldest daughters had their first day of school this past Wednesday. Now, if you’re like me, you’ll think of your first days of each school year, and remember that it was actually the first day back to school, not the first day of school. Sure enough, it was the same with my girls – the first day consisted of going to their classrooms, having papers handed out to them, meeting their new teachers, then going home. Surprisingly enough, they did get homework assignments – bring in a picture or pictures of their loved ones. In a move that I hope is not indicative of the remainder of the school year, they waited until the night before it was due to find the pictures and print them out. Well, in that spirit, I’d like to share with you a picture of my two loved ones, all dressed and ready for their first day of school. This post concludes the September Back To School Blog Challenge, hosted by Matt Conlon on Join Something. This entry was posted in Blog Challenge and tagged Back To School, Blogging, Challenge, Daughters, Education, innocence, Joy, Learning, Personal, School, Student, True Story. First day OF school for us… Good luck. Let’s just say that was the reminiscence of the summer still left in them!